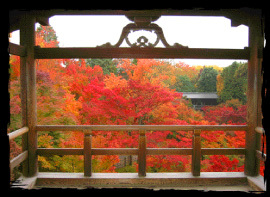 The Tsutenkyo Bridge seems to be floating in a sea of red autumn leaves during the fall. 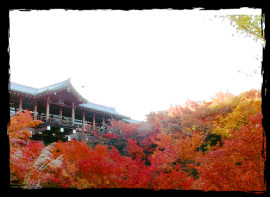 This is probably the scenery people remember most vividly when they think of the autumn scenery at Tofuku-ji Temple. There is a stream flowing between the walls of the Hojo and the Kaizando Hall, forming a valley, and there are about 2,000 maple trees planted on the temple grounds, centered around the Sengyokukan Hall. It is said that the founder of Tofuku-ji Temple, Enni, brought the Tsuten maples back with him from China. The leaves of this maple tree are divided into three parts, and they change to a characteristic gold color in the fall. 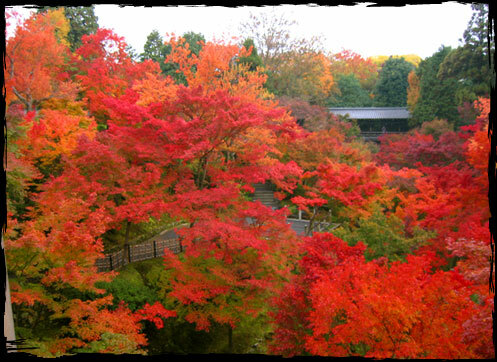 Recently, the fresh green maple trees have been popular even in summer, but in the end, autumn remains very special. Every year the grounds are bustling with people who have come to see the fall foliage, starting in the middle of November when the leaves begin to change and lasting through the first part of December. 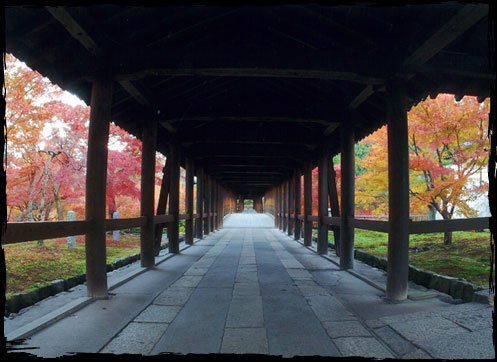 Compared with the abundant autumn leaves, you will see almost no cherry blossom at Tofuku-ji Temple. The reason for this is attributed to a line by Myocho, a monk at the temple who is said to be the founder of monotone ink painting. In his time, Myocho drew a large number of famous paintings, including his painting of a giant cedar and the Sanmon Gate structure and a painting of the "Dainehan Buddha" that even impressed Ashikaga Yoshimochi. It is said that Myocho prayed for all cherry trees to be cut down because their beauty would attract crowds of visitors and distract the monks from their studies. 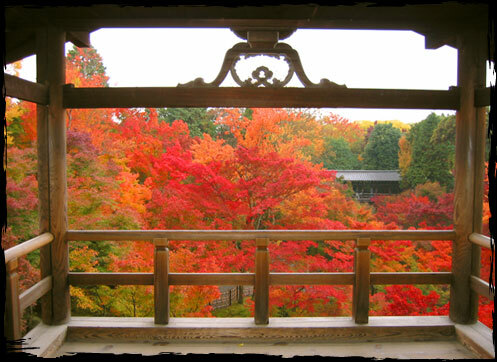 Now, while there are no cherry trees on the temple grounds, the entire grounds are dyed red in autumn by the fall foliage, and a number of stunning views await visitors: the colorful autumn leaves filling the entire view near the Tsutenkyo Bridge, the Hojo, and the mosaic of fallen leaves near the Sengyokukan Hall.